Travel back in time to sail aboard the SS Victory and win battles on the high seas in the name of the Queen. Click here to play! If you can keep your ship afloat in this game, your efforts will definitely be handsomely rewarded. Protect the ship in this high seas adventure. The ships only appear on reels 2, 3 and 4 reels but will substitute for all other symbols, excluding scatters, to help you create more winning combinations. Keep an eye out for order from the Captain. One or more of these seaworthy fellows will get you up to 10000 times your original line bet. The lookout is also there to help. Two or more of him will get you 5000 times your bet. 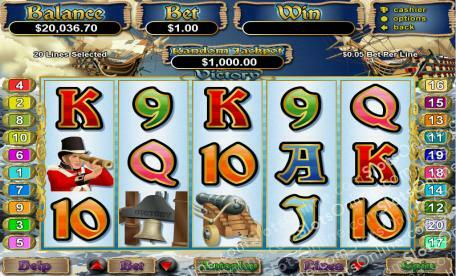 Cannons and Victory bells will help in your quest on the seas, each getting you up to 2000 times your bet. If you can hoist three or more flags anywhere on the board, you can multiply your total bet by up to 500. Three or more anywhere on the board will also trigger a free spin feature that could see you taking up to 50 free spins in which all wins that include a ship are multiplied by 4 and all other wins are doubled. So get aboard the SS Victory for your chance at adventure on the high seas as well as a hefty payoff. The flag acts as a scatter. Three ore more will multiply your total bet. It will also trigger a feature that could reward you with up to 50 free spins. During free spins, all wins including a ship will be multiplied by 4 and all other wins will be doubled. The ship acts as a substitute. This sea vessel only appears on reels 2, 3 and 4 and will substitute for all other symbols excluding scatters.